We've completed the redesign of our popular lighting kit! and other improvements to ease installation into your model! This unique lighting system will allow you to fully illuminate your Polar Lights 1:350 scale Refit ENTERPRISE model without all the time and effort. With this kit you won’t have to solder or calculate anything because all of the work is done for you. All you will have to do is prepare your model for lighting. The kit is made up of pre-wired units. The kit contains new SMD adhesive Light Strips as well as standard LEDs, resistors, lead wire, and plugs & sockets. There is also a completely pre-wired setup for your display base which contains 1 On/Off switch, 1 On/On switch, 1 Co-Ax jack, 1 DC power jack, and one twist-lock main connector. In addition to the pre-wired units, there are also pre-wired photon LEDs. This manual is a printable Adobe PDF, so that you can take it with you to your model building workbench! from “Warp Mode” to "Stand-By" mode. It also includes fading effects that makes the navigational deflector fade on and off while transitioning from stand-by mode to warp mode. Last but not least, self-illuminating floodlight instructions for illuminating the main registry numbers on the saucer section of your Refit Enterprise model. the Lighting Kit in action! 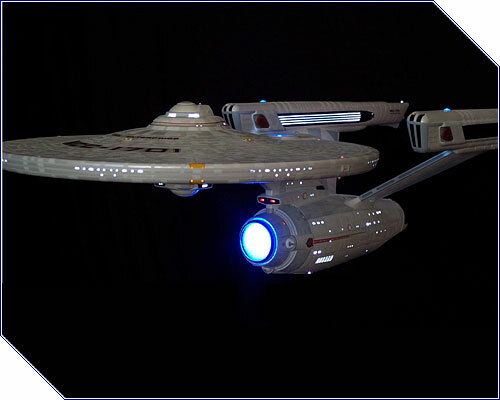 The Lighting Kit was designed using the stock Polar Lights 1/350 scale Enterprise 1701-A model kit, Kit #4204. It will also work with the POL808 version. Aftermarket and 3rd party modification/upgrade parts for this model kit have not been tested for compatibility issues with this kit. Any modifications done to this model kit resulting in compatibility issues with the lighting kit are the responsibility of the modeler and are not the responsibility of TrekModeler. The Lighting Kit was specifically designed for the applications listed on this page and is not alterable. The electronics, parts, and circuits were specifically designed and calculated, and if altered in any way, could damage the kit and/or model. TrekModeler is not responsible for alterations to any lighting kits and/or any damage resulting from such alterations.